Your dining room is piled high with last weekend's yard sale finds, your garage hasn't seen an actual car in years, and you're thinking of buying stock in Rubbermaid. You're grappling with an issue common to many small online sellers: storing inventory. It's surely the worst thing about selling on eBay, other than the DSR and new fee changes, that is, says seller Susan Feinstein Berk, who sells as "North19thstreet" on eBay and on Etsy. But although storing your saleable goods in a neat and organized fashion can be a challenge, many sellers have found a myriad of creative solutions. It seems eBay inventory can creep into any room in the house. "I try and keep stuff on my garage shelves, or in bins, but somehow it all seems to wind up on my dining room table," says Berk. For Sandra Smith Stella, it's a different surface that seems to attract inventory: "My poor husband - we have a pool table that never seems to be empty," she laments. Stella's main storage area is her large basement with storage shelves and three dehumidifiers. "Somehow the inventory spreads to my dining room." For sellers who work out of their own home, designating one part of the house, such as a room or even a closet, sometimes works. "Everything I sell is in one bedroom," says Ilene Asbury, a member of the "Working eBay" Facebook group, whose eBay store is Byhalia-Treasures. "Closet, Rubbermaid cabinet, and storage bins under the bed. All my shipping supplies are there and I use the bed as my packing table. There's a better way, I'm sure, but I live alone, so it works for me," she says. Amy Doucette-Allen (Handworks-Collectibles) also works out of one of the bedrooms in her home. "My stock is mostly miniatures, and it fits into a large bedroom we lined with shelves," she says. "Two center shelves back-to-back make an "E" shape." She keeps her packing and shipping supplies there as well. "On the end of that I have a table for shipping with a roll of biodegradable bubble wrap mounted on the book shelf ends. I have an assortment of all sizes of boxes and padded envelopes handy." She stores the excess in her travel trailer along with the outdoor Christmas decorations. "All stock is stored by type or manufacturer," she says. In some cases, spouses are part of the business or help with the organizing. Evelyn Carol White Mealey, also posting in the "Working eBay" group, said her husband built wall-to-wall shelves, and inventory is kept for the most part in SKU order. (Her miniatures store is Carols Butterfly Boutique). "Most of the year my inventory is in the extra bedroom," she said. "What used to be the dining room is the shipping department. October through January the products won't fit in the extra room, so it spreads to the rest of the house until after the holidays," she said. But sometimes a seller's clutter can be a source of tension with his or her spouse. eBay UK seller Andrew Titcombe, who sells collectible cd's on eBay at CrucialMusic, says his inventory is in every room in the house, and joked, "finally my wife has made me sleep outside in the dog's kennel!" "When the stuff is just too much for the house, some sellers find renting outside space is the best move. "When my stuff outgrew our garage (and my husband's patience) I looked into renting a storage unit," says seller Amy Kagey ("amycats2," her store is Collectibilities on eBay). "Luckily, my friend's dad offered me an unused office storage space in his building for the same price as a unit. 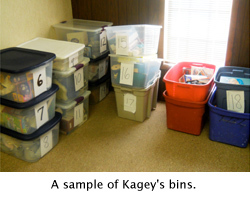 I keep everything in Rubbermaid tubs that are numbered and then when I create a listing, I put at the bottom of the description, "Bin3" or whatever." "In my case, renting was very necessary and actually the only way I could grow," she says. "I list from home, then move the completed tub to my office. One of the best decisions I've made! I waited a long time to rent space, and it helped my business a lot." Office space and storage units come in many forms. For Linda Golden, who sells garden decor in her eBay store Garden-Spin, it was a shed she built herself. "I got everything out of my house & enclosed porch in March," she said. "It felt like I was living in a warehouse; couldn't stand to even be in the "office" anymore. I built one of the Rubbermaid sheds in the back yard - vents, skylights, double doors. Put in shelving, then all (the) inventory. I like having my home back." 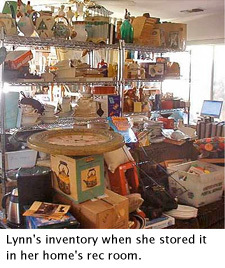 But perhaps the best known case of "I'm taking my house back" is that of Lynn Dralle, Queen of Auctions, who lists 100 "OOAK" (one of a kind) items each week. Dralle finally went the office route when she found her inventory of thousands of items taking over her home. "Storing my inventory of approximately 12,000 items listed on eBay (6322 active listings, with many being multiples) and another 10,000 to be listed was quite a challenge when I had my business in my home," she said. "Can you even imagine?" Her main eBay room was a 600 square-foot rec room that housed the 11,000 listed items. "The shelving units wrapped around in a complex pattern worse than an English maze!" she said. The 10,000 items that needed to be listed were everywhere, she said: "My garage, my dining room, my storage unit and probably even in my car!" She moved her eBay inventory into office space in November of 2010, "and it was a fantastic decision," she said. "We now have all of our eBay shelves in straight rows - much better than an English maze." Her items now get placed on a shelf in her new warehouse. She uses a system where "each shelf has a letter attached to it, and that letter is written on the "isell" sheet associated with that item and also written in our actual auction descriptions." Her shelves are labeled from a to z, then aa to zz, and so on. "I do have to admit that a straight numbering system - 1 through 104 - would have been a much better system," she said. What do sellers do when they simply get too much inventory, or cry uncle that something is ever going to sell? One seller who has reached her space limit is "Working eBay" group member Patricia Bugg (Treasures from Trish), whose late father used to attend auctions every night of the week. Her unlisted inventory is packed in five semi trailers, a construction trailer, seven sheds, four barns, a garage, several campers, four trucks and seven vans. She's currently poring over her options to move her merchandise quickly, including "big lot" auctions. Many sellers decide to donate it to charity. "Every month or two I sweep through and put the "never gonna sell" stuff in a box and take it to consignment shop or Goodwill," says Berk. "I'm happy to say I have taken three car loads to a garage sale our animal shelter is having on Saturday," said Stella. "It feels so good to let go of things I knew I was never going to get to, and help the animals at the same time." Designate one part of the house for your storage, shipping and online-selling activities; keep packing and shipping supplies handy. Store excess inventory off-site - use a system so you can easily locate it. For example, Doucette-Allen stores her excess goods in a travel trailer and organizes it by type or manufacturer. Get creative. Linda Golden built her own "warehouse" by building a Rubbermaid shed in her back yard. Recognize when you need to move your entire operations out of your home. 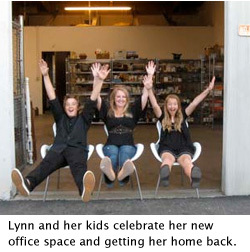 Lynn Dralle became more efficient and productive when she took the leap. Be realistic. Identify items you'll never get around to or will never sell, and get rid of them; consider donating them to a charity, as Patricia Bugg does. Your storage costs can be tax deductible - be sure to talk to your accountant, and save those receipts! Share your tips on the AuctionBytes Blog.